New Wave Domesticity: Introducing New Wave Domesticity! I stated this blog in 2009 and at the time the name "Sew Darn Thrifty" seemed to fit me, it was cutesy and it had a pun or two. I didn't have a strong direction with it, I just liked to sew sometimes and I was addicted to thrifting, so Sew Darn Thrifty came to be. Fast forward to 2013, I found myself coming back to blogging as a way to rediscover the things that I love and find myself again, so I just picked up the blog I had created 4 years ago since it seemed to have a few visitors via pinterest & google while I was gone. I realized that I love blogging, it almost gives me the sense of excitement & community that I've been missing. It keeps me inspired to make projects and food and be proud of the small, everyday wonderful things that make up my life. personal evolution to the person that I am now. I want to redefine the way that homemaking has delineated. The Domesticity part is pretty obvious. I realized that this blog is not about sewing or thrifting or any one thing. It is about the little, seemingly mundane tasks that make home for us. It's about using raw materials to create a beautiful piece of art or all of the right ingredients to bake a perfect cake. These domestic things are also more than just consumerism and commonplace, it is how we express love for ourselves and those around us. These are the small actions are the things that make us who we are. 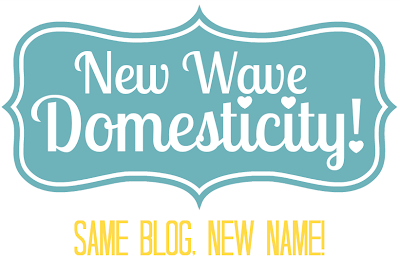 New Wave Domesticity was also the title of a zine I wrote a few years ago and it has stuck with me, so I am happy to make this part of that continued project. I will be updating all my external links in the next few days. The old links & bookmarks on Pinterest and the like will still be valid and will just forward on over to www.newwavedomesticity.com! If you are following on Bloglovin (thank you! ), you will just automatically be transferred over to follow the new name. If you have any other questions or happen to think of something I missed, please get in touch! Thank you all so much for your support and for following along with me! Stay tuned for some fun giveaways & celebration for this new adventure! LOVE IT! Oh my goodness: I am so excited for you to start this journey and am so glad to be able to be a part of it with you! People grow, and their blogs should too... I know one day I won't be too young, or even young enough to keep my name, so I plan on just x-ing the "young" part out, hahaha!